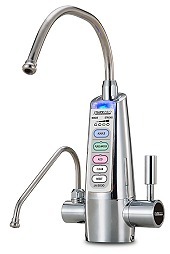 The world's best selling water ionizer is PurePro Water Ionizer. It comes with the Large 5-plate polymer ion-plated platinum coated titanium ionizing plates (est. life 20 yrs, latest Japanese University technology). It produces an Ionized Water of about 10.0 pH or higher, depending on your water source. Regarding quality and ionization strength, the PurePro Water Ionizer is comparable to any other water ionizer on the market.